Hello, traders. Welcome to the Elliott Wave Theory course, and the first module, Introduction to the Elliott Wave Theory. 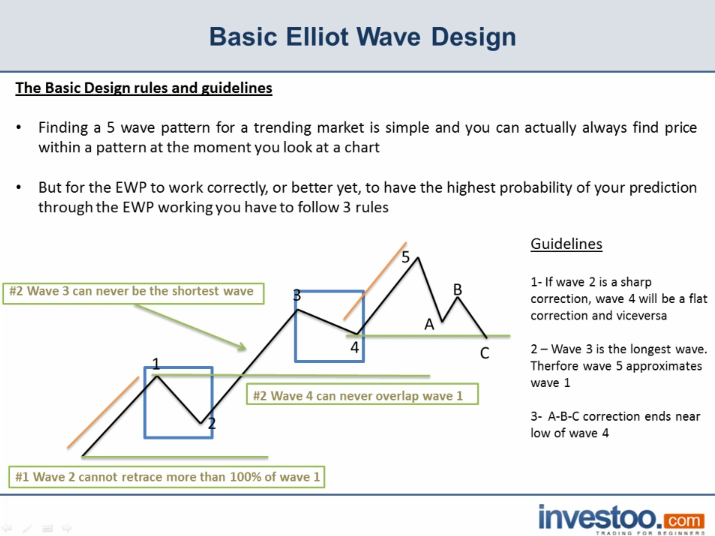 In this lesson, we are going to learn about the rules of the basic Elliott Wave Design. And this is very important because, well, as you already know, you can always put the higher timeframes or any timeframe for this matter on a five-wave pattern at the moment you look at the charts. But you have to follow certain rules and guidelines because not every five-wave pattern is truly a basic pattern. So let’s go through the rules and guidelines right now. Finding a five-wave pattern for a trending market is simple. You can actually always find price within a pattern the moment you look at a chart. This can be on the higher timeframes or on the lower timeframes. But for the Elliott Wave Principle to work correctly, or better yet, to have the highest probability of your prediction through the Elliott Wave Principle working, you have to follow three basic rules. So the first rule is that wave two cannot retrace more than 100% of wave one. This means that when we have the first impulse on the trending market, or the first directional impulse, the first corrective impulse cannot retrace more than the low of the first impulse or the first wave. This is the first rule. If you have the first wave and then wave two retraces more than 100% of wave one, this is not truly a basic design. Now the second rule: wave four can never overlap wave one. This means that when you are in the second corrective wave of the five-wave pattern, wave four, or the second corrective wave can never go below the high of wave one. This means that if you are in the wave four on a five-wave design, this wave can never go below the high of wave one. If it goes below the design, it’s erroneous and you can let it go. The third rule: wave three can never be the shortest wave. This means that if we have wave three being the shortest wave on the five-wave pattern, this is also an erroneous pattern, and there’s a better probability that your trade will go wrong if you follow the Elliot Wave Principle to trade it. So these are the basic or the “hard-on” rules that you need to follow. Wave two cannot retrace more than 100% of wave one, wave four can never overlap wave one, and wave three can never be the shortest wave. It can be the second shortest wave, but never the shortest wave. Now, there are three guidelines that we also need to follow. And remember these are guidelines. They are not rules, so they are not to be followed 100%. They can be bent a little. But you also need to follow them to have highest probability of your prediction going correctly. So let’s go through the guidelines. If wave two is a sharp correction, wave four will be a flat correction and vice versa. If wave two is a flat correction, wave four will be a sharp correction. Again, these are guidelines, but let’s say that you are at the end of wave three and wave two was a sharp correction. You can expect wave four to be a flat correction before taking the long trade at the end of wave four. Another guideline if wave three is the longest wave, therefore wave five approximates wave one. This is a very good guideline, guys, because if wave three is the highest or the longest wave and you are trading wave four, you can actually calculate the target of your long trade by calculating with pips or ticks how long was wave one. And the third and last guideline: the A-B-C correction ends near the low of wave four. And again, this is another guideline. Sometimes it will go a little bit lower than the end of wave four, but basically this is the design you are looking for in order to trade wave one of the next directional move to the upside. So whenever you are trying to find where price is at the moment inside a five-wave or inside a basic design, and remember, a basic design has a five-wave directional pattern and a three-wave corrective pattern. So if you want to find where price is at inside a basic design, you need to follow these rules and guidelines for you to have the highest probability of your prediction and trade going correctly.